All models Magnet Weight 33 oz. All models Packaging Dimensions 11.3 in. x 10.8 in. x 5 in. All models Weight 4.8 lbs. Recently, I got a Marshall Lead 12 Micro Stack (solid state, made in 1986), well it was just the head and only 1 1x10 cab, a micro half stack if you will, and it had the original Celestion G10D-25 speaker in it. That speaker was designed to simply make a sound, not a good sound, just a sound. The speaker made the amp just plain fizzy, Set the treble above 3, and it was just pure fizz, not enough bass either, so yeah, a thin fizzy tone. 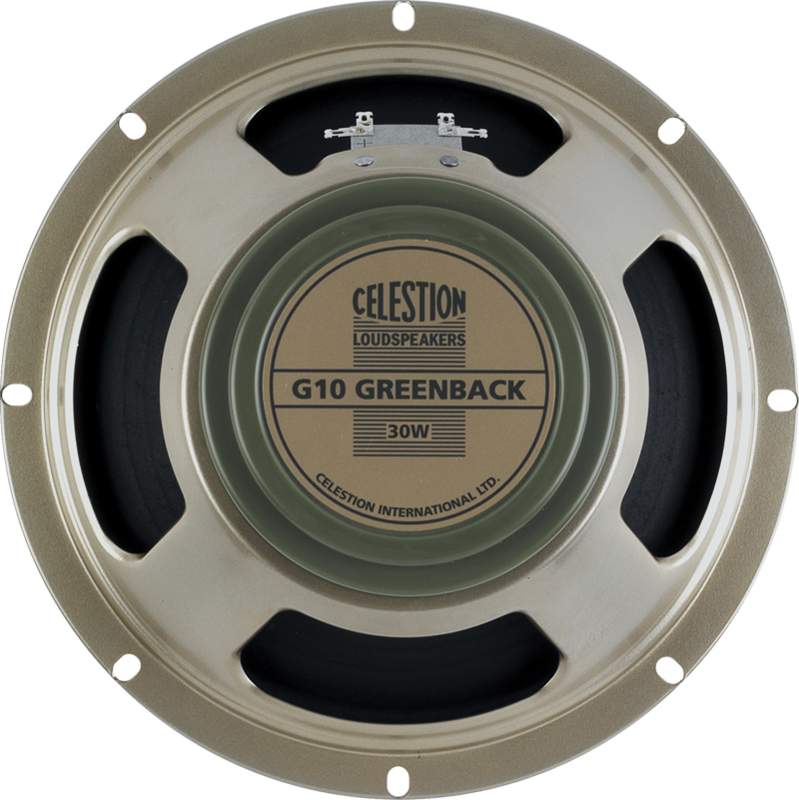 I looked at the Ten 30, the G10N-40, the Celestion G 10 Vintage and finally the most expensive of the bunch, the Greenback. There was no videos or sound samples of the 10" greenback with a lead 12, so I was taking a chance, but it's a MASSIVE improvement. The amp is not fizzy at all anymore, much improved bass and mids, and it's quite a lot louder than the old speaker. It really doesn't sound like a Solid State amp anymore. The problem most people have with Solid State amps isn't the fact it's transistors and not tubes, it's really the cheap speakers that are put into them, a good speaker with the right EQ curve will make a solid state amp sound much better. I use this speaker in 2 of my amps, a Crate Club 20r made this amp sound 10x better then the stock Eminence speaker and I installed it in my Peavey Classic 20 and this amp is my pride and joy of all the amp I own. I just bought another Greenback 10 for my Peavey Delta Blues 210 for one side and on the other side I will install the new Jensen Electric Lightning. I am excited about the new setup with that.